A new book by Peter Reid and Tim Goddard presents LEGO versions of familiar space technology alongside futuristic visions. 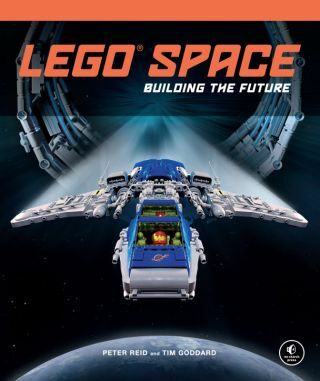 No Starch Press will publish "LEGO Space: Building the Future" on November 11, 2013. Two artists built their vision of the future of human spaceflight brick by brick, and you can see it in a new book. "LEGO Space: Building the Future" (No Starch Press, 2013) details Peter Reid and Tim Goddard's unique idea of a fictional future world of space travel. The new book — set for release in November — details an incredible fantasy universe filled with future space stations, robots and inventive spacecraft built from repurposed LEGO sets. "The narrative evolved and grew in quite an interesting way," Reid told SPACE.com via email. "We began with a rough idea of the direction the story might take, and a handful of models that we'd already built. Of course, the story took its own course, and we had to build lots of new models and dioramas to fit in with the story." LEGO bricks form a model Sputnik satellite. Reid and Goddard pay homage to the past from the very beginning of the book. A LEGO Sputnik — the first artificial satellite to orbit Earth — is featured prominently in the first few pages of the book, and a somewhat lonely-looking Mars rover Curiosity built from LEGOs roams the Red Planet. From there, however, Goddard and Reid really let their creativity shine. They developed their idea for The Federation using a combination of real and fictional notions of spaceflight. "We needed to try and bring order to the vague backstory from old LEGO space sets," Reid said. "The Federation grew from the space administrations of the present-day. They act as a united government, working in space for the benefit of mankind. They are the good guys, the hotshot pilots and brilliant scientists who explore the solar system." To build the models in the book, Reid and Goddard used a combination of their own childhood LEGO collections and other specific pieces they bought online. LEGO bricks make up a imagined moonbase. While Goddard and Reid aren't sure how many LEGO sets it took to create the world in the book, they did have to use some creative methods for building their vision from the tiny plastic bricks. "The beauty of working with LEGO is the sets are just a starting point," Goddard said. "Once you've followed the instructions and built the model on the box, you can take it apart and start using your imagination to build something bigger and better." Reid and Goddard have included sets of building instructions within the book to help fans build the ships, stations and other aspects of their future world at home. You can order the book on Amazon.com.